US senators are about to grant the president the authority to wage "unlimited war for as long as he or his successors may wish," former Republican congressman Ron Paul notes, adding that if they succeed in passing the legislation the American Constitution will be all but a "dead letter." Senate Majority Leader Mitch McConnell and Senator Lindsey Graham are seeking to provide President Obama and his successors with the authority to wage unlimited wars without restrictions on time, geographic scope, or the use of ground troops, former congressman and two-time Republican presidential candidate Ron Paul emphasizes. The move may become "the most massive transfer of power from the Legislative to the Executive branch in our history," the American politician warns. "President Obama has already far surpassed even his predecessor, George W. Bush, in taking the country to war without even the fig leaf of an authorization. In 2011 the president invaded Libya, overthrew its government, and oversaw the assassination of its leader, without even bothering to ask for Congressional approval," Dr. Paul writes in his article for The Institute for Peace and Prosperity. However, it seems that the US senators are about to extend Obama's capability to launch all-out military campaigns. ​"The AUMF [Authorization for the Use of Military Force] I introduced…will not limit us in terms of time, geography, or means in the fight against ISIL [Daesh]. It will show our enemies and friends alike that we will destroy ISIL wherever they reside, fight them as long as they pose a threat, and that we are 'all-in' when it comes to their destruction," said Graham, a member of the Senate Armed Services Committee Tuesday as quoted by USA Today. Meanwhile, the White House has demonstrated its willingness to expand the US military's operations in the Middle East and North Africa. The New York Times' editorial board reported Tuesday that the Obama administration is considering opening the third front in its war against Daesh in Libya, adding that the campaign could begin in a matter of weeks. "This significant escalation is being planned without a meaningful debate in Congress about the merits and risks of a military campaign that is expected to include airstrikes and raids by elite American troops," the media outlet notes. At the same time, US Defense Secretary Ashton Carter clearly stated that there will be more boots on the ground in Iraq and Syria in an interview with CNBC. "The prospects of such an escalation are not all that far-fetched. At the insistence of Saudi Arabia and with US backing, the representatives of the Syrian opposition at the Geneva peace talks will include members of the Army of Islam, which has fought with al-Qaeda in Syria," Dr. Paul emphasizes, asking why the US leadership agreed to hold talks with al-Qaeda's "offspring." In this context, the decision of the US Senate members to grant the US president with expanded war powers seems especially troubling. "The purpose of the Legislative branch of our government is to restrict the Executive branch's power," Ron Paul stresses, adding that if Senate Majority Leader McConnell succeeds in passing the legislation, "the US Constitution will be all but a dead letter." Willy-Nilly Partnership: What’s the Hidden Aim of Biden’s Trip to Turkey? 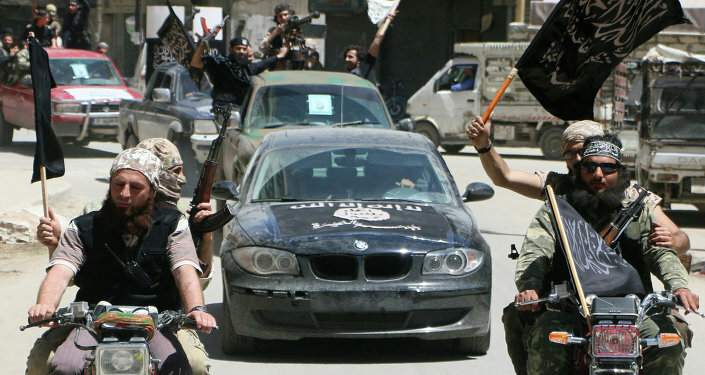 US Think Tank Admits What Moscow Has Said All Along: Al-Nusra's Dangerous!